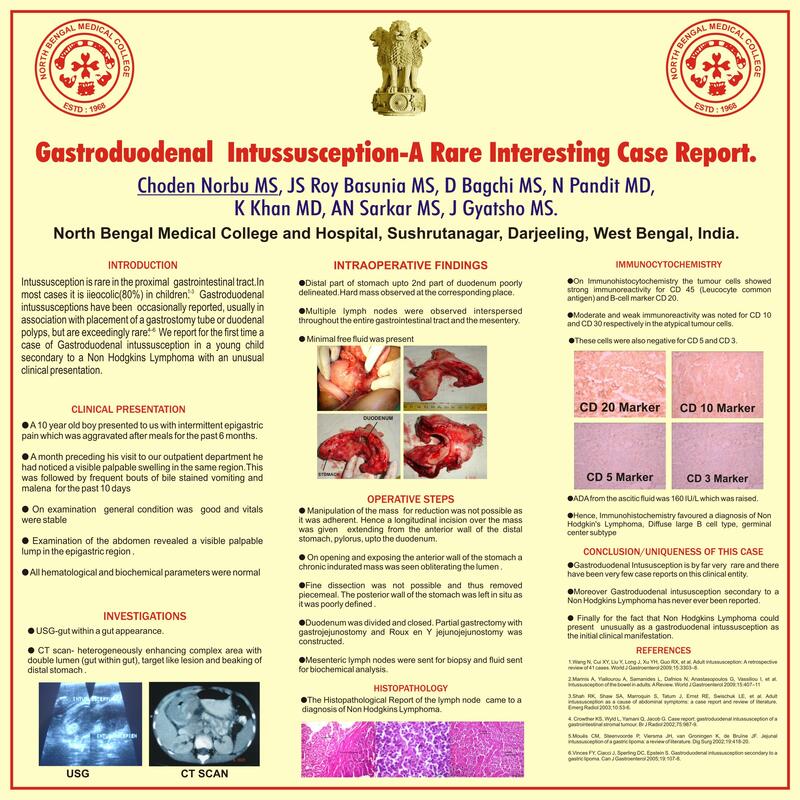 Gastroduodenal Intussusception-A Rare Interesting Case Report. Gatruduodenal Intussception is by far a very rare clinical entity reported in the literature.We present a rare case in a 10 year old boy who presented to us with features of subacute gastrointestinal obstruction.A presumptive diagnosis of gastroduodenal intussusception was made which was later confirmed on Ultrasonography,Barium Meal study and Computed Tomogram of the Abdomen. At Laporotomy the distal part of the stomach and duodenum upto the 2nd part was poorly delineated and a hard mass was observed at the corresponding place.Multiple lymph nodes were observed interspersed throughout the entire gastrointestinal tract and the mesentery.Minimal free fluid was present. Manipulation of the mass for reduction was not possible as it was adherent.Hence a longitudinal incision over the mass was given extending from the anterior wall of the distal stomach ,pylorus upto the duodenum.On opening and exposing the anterior wall of the stomach a chronic indurated mass was seen obliterating the lumen .Fine dissection was not possible and thus removed piece meal.The post wall of the stomach was left in situ as it was poorly defined .Duodenum was divided and closed.Partial gastrectomy with gastrojejunostomy and roux en Y jejunojejunostomy was constructed.Mesenteric lymph nodes were sent for biopsy and fluid sent for biochemical analysis. Our presumptive diagnosis intraoperatively was on the lines of a gastroduodenal intussusception secondary to a tubercular lymphadenitis or a lymphoproliferative disorder. The Ascitic Fluid analysis report documented an increased ADA level of 162 IU/L.The Histopathological Report of the lymph node that arrived subsequently came to a diagnosis of Non Hodgkins Lymphoma. 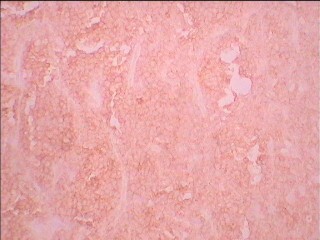 On Immunohistocytochemistry the tumour cells showed strong immunoreactivity for CD 45 (Leucocyte common antigen) and B-cell marker CD 20. Moderate and weak immunoreactivity was noted for CD 10 and CD 30 respectively in the atypical tumour cells. 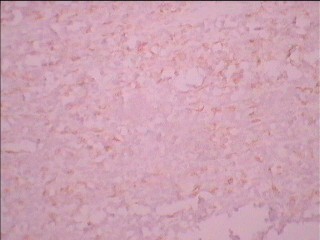 These cells were also negative for CD 5 and CD 3. 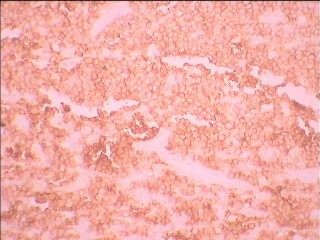 Hence, immunohistochemistry favored a diagnosis of Non Hodgkin Lymphoma, Diffuse large B cell type, germinal center subtype. Post operatively the patient was recovering well on his last visit and we have now referred him to a Medical Specialist for initiation of chemotherapy. Gastroduodenal Intususception is by far very rare and there have been very few case reports on this clinical entity.To the best of our knowledge Gastroduodenal intususception secondary to a Non Hodgkins Lymphoma has never ever been reported.Suprisingly we also observed that this patient had no systemic features suggestive of a lymphoid malignancy .It was only on histopathological and immunohistochemistry examination of the lymph nodes that the diagnosis was ascertained. because it adds to the literature of the very few cases of gastroduodenal intussusception reported so far .Secondly, a Gastroduodenal intussusceptions secondary to a Non Hodgkins lymphoma has never ever been reported and finally for the fact that this Lymphoid malignancy could present as a gastroduodenal intusussception as the initial clinical manifesting feature ,as was the case in our patient.